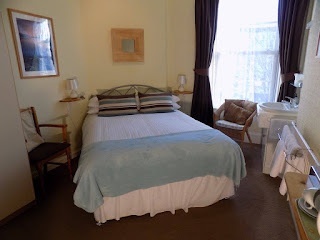 Haven House is a charming guest house in Torquay, Devon. It is on Scarborough Road within the heart of Torquay, making us the perfect place to escape to from the hustle and bustle of modern life. Free Wi-Fi is available throughout the Haven. Parking is provided free of charge within our small car park at the rear and there is free street parking to the front. We are just a few minutes’ walk ( 300/400 yds) from Torre Abbey and gardens, and the Riviera Centre with its excellent conference, leisure, sporting and dining facilities. Close also lies Abbey Sands Beach, the Princess Theatre, and the harbour offering many varied sightseeing and fishing boat trips. Leaving Haven House in the opposite direction Torquay's main shopping street is a similar distance away. The two walks can be linked to form a circuit which will easily orientate the first time visitor and we have maps available for this purpose. Many guests here for short breaks do not move their cars until they depart! Torbay has more than its share of pubs and clubs. On many nights during the summer there are firework displays and evening harbour cruises. Couple this with the pretty harbour lights and you complete a lively and attractive scene.